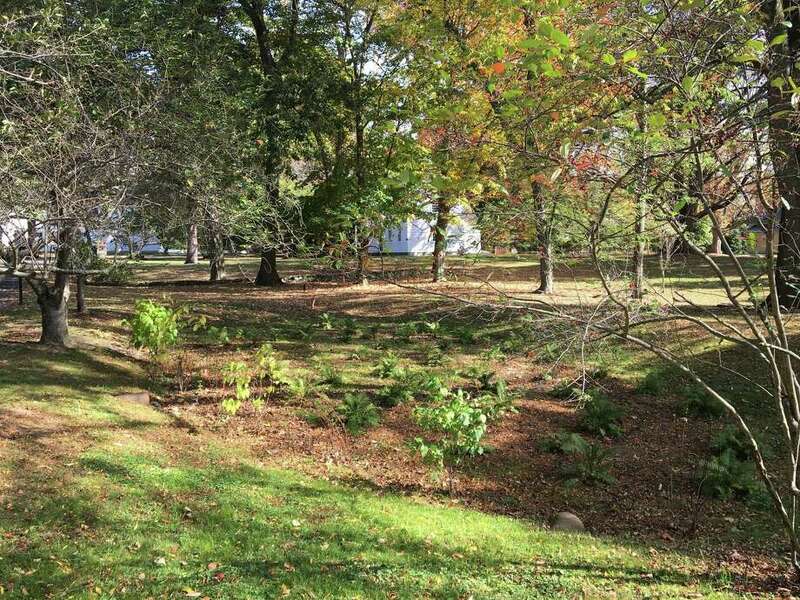 The shallow depression on the Museum Commons, above, located between the Fairfield Museum and the Old Academy) on the Museum Commons was once a body of water called Edward’s Pond. At this spooky time of year, it is an appropriate moment to share the history of Edward’s Pond and the “witches” who were dunked there. In 1692, while the Salem witch trials took place in Massachusetts, Fairfield had its own witch trial. On October 28, 1692 the Fairfield trial of Goody Clawson and Goody Disborough was held. Katherine Branch, a servant girl living with Daniel and Abigail Wescott had become “possessed” and the caused was determined to be witchcraft. She accused six women in total and two went to trial: Elizabeth Clawson of Stamford and Mercy Disborough of Compo (now Westport). Hoping to prove her innocence, Mercy asked “to be tried by being cast into ye water.” Both women were taken to this pond, bound hand to foot and pushed into the water. At that time it was believe that a witch would float. Witnesses testified that both women “put into the water swam like a cork.” Despite this outcome, neither woman was executed. After many deliberations between the jurors, magistrates, ministers and the colonial government in Hartford, the jury acquitted Goody Clawson but found Goody Disborough guilty. Fearing more hysteria, three magistrates granted Disborough a reprieve based on a technicality. Recent events in Salem, they wrote, “should be warning enough.” The last two people to be tried for witchcraft in the colonies were Winifred Benham and Winifred Benham, Jr. from Wallingford. They were acquitted. Later in the 1800s, Edward’s Pond was called “Academy Pond” because it was a popular place for students from nearby Fairfield Academy to gather, swim and skate. The Town filled in the pond around 1869, with the condition that no buildings be erected so the land would remain part of this public space in perpetuity. This Sunday, from 12-4pm the Fairfield Museum will host Halloween on the Green and visitors can step into the depression that used to be Edward’s Pond and read the signage next to it to learn more. The year Fairfield had its own witch trial of Goody Clawson and Goody Disborough . The Fairfield Museum & History Center and Museum Shop, located at 370 Beach Road, is open seven days a week, 10am-4pm. Members of the Museum and children under 5 are admitted free. For more information, call 203-259-1598 or visit Fairfieldhistory.org. The Fairfield Museum relies on funding from individuals, corporations and foundations.